Let me do a magic trick. Here's a bunch of snow... and then TADA! Now have 60 degrees and sunshine to make it all disappear! That's what's up in northern Minnesota this week and I'm not complaining one bit. I did get in a snowy run on Sunday but now the kids and I have been thoroughly enjoying this more Fall-like weather. As soon as we finished school this morning, we all headed outside and nearly forgot to come in for lunch! It's just THAT amazing out. While there is plenty of action in our daily family life, my running calendar is a whole lot less exciting. What IS exciting is that after two months of healing/rehabbing, my hip flexor strain is improving by leaps and bounds. I dabble in a run here and there, not covering many miles nor hitting record speeds. This injury break has been very low-key and I plan to stay in this not-training-for-anything mode through the rest of this year. Though my hopes for fall goal races ended abruptly this year, I'm enjoying the days God has given me right now and am looking forward to good things to come. My "Believe" Training Journal came in the mail this week and braining storming my goals + dreams has been a great encouragement! My October running calendar isn't completely empty though! My pup and I did complete the Doo Good 5k back in September and now we're moving on to the Scoobtober 5k/10k this month. The Scooby Doo Virtual Race Series has been a great motivator to keep me out and about, even though that injury stole much of my motivation, and Saul (dog) can use a little extra exercise too. Saul, the kids, and I have put on a few miles already towards our Scoobtober 10k goal. If this beautiful break in the weather sticks around, I anticipate us completing the distance soon. October 31st is the deadline to get the Scoobtober miles completed! Want to join in the virtual run experience? You can register for the Scoobtober 5k/10k from now through October 20th. Registration for the Scoobtober Run is $39 for humans and a $15 Add-On for any canine participants. Join in our next virtual race adventure and click HERE to register: Use discount code BIBRAVE for 10% off registration! What challenge are you chasing this October? P.S. How adorable are all of the Doo Good 5k BibRave Pro Pups below?! 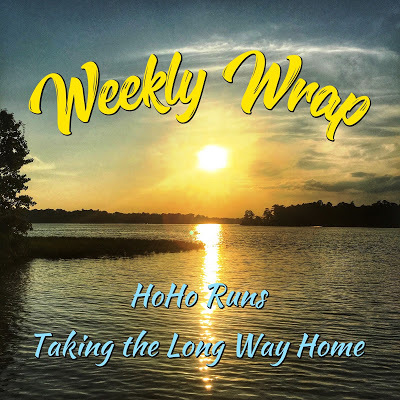 Thank you, Katy @ Run Katy Run, for making this adorable picture round-up! SUN: 6.05 mi, 00:52 @ 08:35 pace. Had to go out for a run in the sleet and snow! WED: Easy Run 3.53 mi, 00:30 @ 08:32 pac after a walk/run with the kids + dog + big kid on bike (that's always interesting, we only made it .63 of a mile). My hip flexor is feeling much better though I'm still looking to run only a few times a week at least til December. The goal is to get completely healed up so this doesn't linger through marathon training in 2019. THURS: Yardwork and a walk with the kids because it's in the 60's and sunny again!!! Goodbye snow, for now. Disclaimer: I received a Luvo Bundle of my choice in exchange for my review as part of being a BibRave Pro. Learn more about becoming a BibRave Pro (ambassador) and check out BibRave.com to review find and write race reviews! "I'm dreaming of a white October, just like one that happened a few years ago..."
It seems our Fall has been shortened but most Minnesnowtans (at least around here) are sure it will melt soon. I agree with that. Now if this snow sticks around until April 2019, I may just lose my Minnesota-loving mind! While the snow is here, we're rocking our new routine of the kids heading outside to play in the snow immediately after breakfast, snow gear strewn all over our house and hot chocolate with our morning basket reads. Though 38 degrees is a considerably warm temp for winter around here, it's NOT winter. So let's warm things up a bit as I give you a quick lowdown on my latest review, a couple tasty, warm dishes from Luvo. As a BibRave Pro, I received the Southwest Inspired Sampler from the Luvo Bundles selection which includes four Quinoa & Veggie Enchilada Verde bowls and four Chicken Chorizo Chili bowls. Having Luvo meals on hand is so, for lack of a better word, handy. Our life lately has felt like a tornado of little people. Sweet and so fun but the activity starts at 6:30 am and only ceases at 8 pm unless they all end up taking a nap. That being said, I've found my food-loving self can actually forget to feed myself. Remembering to eat has never been a problem for me! But I've found with the morning lessons for our Kindergartener, finding fun activities for our 3-yr-old and keeping baby out of trouble, feeding myself just seems like an extra hassle. And now I'm wondering how on earth I had fit marathon training into my life before I was injured 6 weeks ago! Somehow we make it work out, right? I've found that after our morning devotional, read aloud books and my Kindergartener's individual lessons, the older boys go off for a "free play" break and I eat MY lunch before making their lunch. The Luvo bowl takes approximately 5 minutes to cook/cool and be ready to eat. It definitely has taken the hassle out of my lunch break. I have always associated microwave meals with super high sodium but that's not the case with Luvo. The two meals in this Southwest bundle contain 340-360 mg of sodium each. That's not too bad. Both of the flavors are quite tasty! The Quinoa & Veggie Enchilada Verde is my favorite as it has a nice mix of veggie and citrus flavor, with some but not too much spice. It's a vegetarian dish so I do add my own deli turkey meat and sometimes avocado to "beef things up" a bit. Vegetarian dishes don't leave me feeling full for very long. This Luvo Bundle included 4 bowls of the two flavors (8 total bowls) for $43.12 currently on their website which computes out to $5.39 per bowl. These bowls are a quick, healthy option if you're on the go a lot or just short for time. What is your go-to meal in a pinch? MON: Easy Run 3.4 mi, 00:31 @ 09:07 pace at 6 wks post-injury. Felt a little stiff on front-right side groin/adductor. Likely due to tight IT bands and hamstring. Need to do hip stretches DAILY! The stiffness felt a bit better as I warmed up. TUES: Chiro appointment this morning and afternoon Runner’s Yoga. She said to avoid core exercises that twist — that was likely the culprit bothering my injury. It’s sounding more like a hip flexor strain as this healing process carries on. Our chiro has been so helpful! WED: Cycling 10.5 mi and rehab exercises for the hip flexor sprain. Knowing the problem at least helps direct the rehab process! 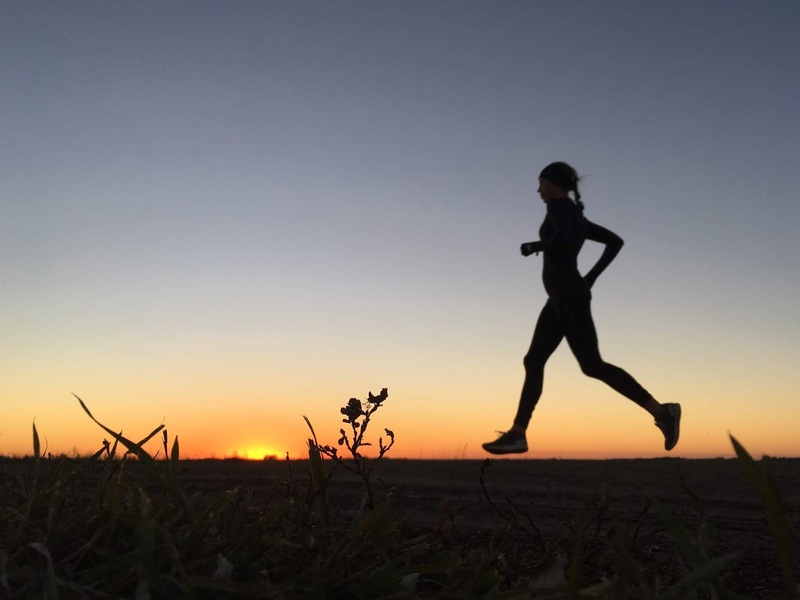 (Especially exercises to DO or NOT to do) Signed up for Fargo Marathon. 2019 too... :) Here’s to that being my first complete Hanson’s training cycle. SAT: (Treadmill) Easy Run 3.32 mi, 00:30 @ 09:02 pace while the kids watched PJ Masks. 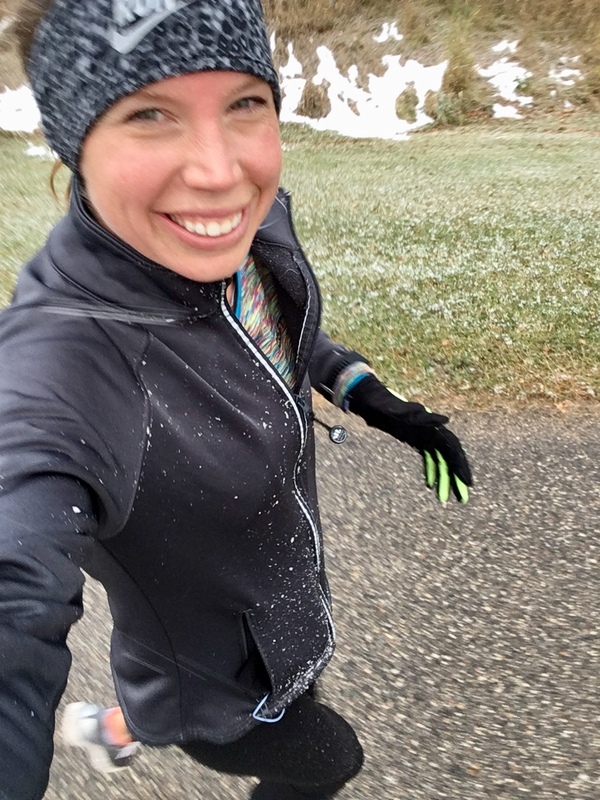 And I finally made it out for a snowy run on Sunday! Disclaimer: I received a Bedgear Performance Pillow in exchange for my review as part of being a BibRave Pro. Learn more about becoming a BibRave Pro (ambassador) and check out BibRave.com to review find and write race reviews! Lack of sleep really takes a toll on our bodies. That's been the past week or so in a nutshell - I feel sluggish, my emotions feel a little haywire and my neck/shoulder muscles are tense (usually because I was rocking a baby or sitting in some weird position most of the night). Not every night involves being up 3 or 4 times but, when those nights come, the residual exhaustion seems to linger for days after. As our baby has been waking more at night thanks to either popping his 5th tooth or his new walking milestone, you're catching me in one of those residual exhaustion phases. So what better time to test a new pillow, right? A new pillow is yet another reason to be excited about bedtime! As a BibRave Pro, I received a Bedgear Performance Pillow to review. Bedgear's website claims that they are "Bedding for People Who Like Being Awake" and, yes, I do like to be awake after a good night's rest! Unlike any other pillow buying experience I have had, the first step to selecting my Bedgear pillow began with a... quiz? It's a good thing, I promise. Pillow ID asks a few questions in order to fit you with the performance pillow that meets your unique needs. 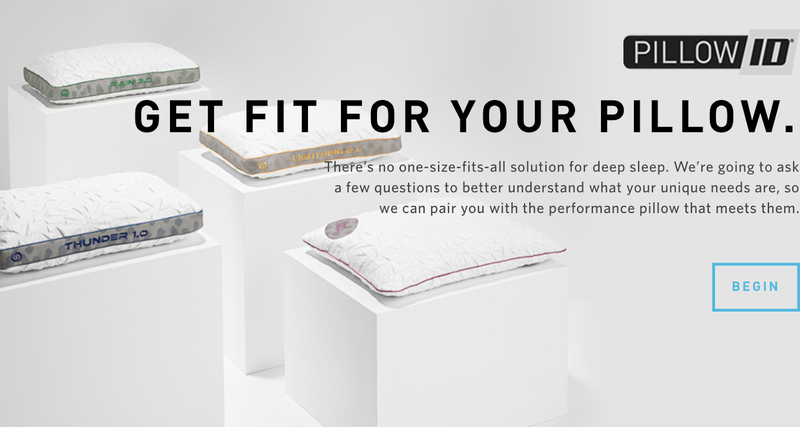 After answering four quick questions, I was matched up with the Balance 1.0 pillow because of my small frame and all-over-the-place sleep style. After three weeks of sleeping on my Balance 1.0 pillow, I would say the Pillow ID made a great match. I like the firmer, elevated feel and I don't feel like I'm overheating (my sleep pet peeve). Though I'm still up at least once a night with our littlest boy, when I crawl back into bed I sleep really well. Now my husband wants one. We'll see which pillow fits him best! Bedgear offers a huge selection of pillows and other products to fit every body type and sleeping preference. Take the Pillow ID to see what pillow you match up with. Once you've found your match, take 15% off your online order with discount code "BIBRAVE15" (excluding WOW Deals, valid through 11/30/18). I just ordered my husband a Balance 3.0 and can't wait to for it to arrive! What is your sleeping "pet peeve"? Easing back into running after a 2nd degree groin pull in mid-August. SUN: Off. Recovery after Saturday's Half Marathon. We ran together the whole race and celebrated #NationalCoffeeDay with post-race lattes! MON: Stretching and foam rolling after the half marathon on Saturday. We didn't run particularly fast but that was still 2:55 spent on my feet and my quads reminded me of that! My groin/adductor felt a little sore but it was likely due to my tight hips. WED: 4.08 mi, 00:33 @ 08:01 pace. I headed out for an injury "test run" to see how my recovery process is going since the half marathon last weekend. It was windy/snowy/cold but a run sounded great anyways. It takes me a little to get warmed up, but I felt GREAT. No pain! Just a little stiffness in the adductor, but not in the front of my pelvis where it was before. Much better. Miles were 8:24, 8:01, 8:09, 7:38 and my cardio system didn't feel terribly taxed. The biking must be helping with the cardio a little! Did planks that night. 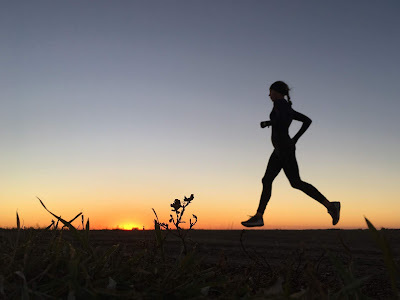 That's about all the strength I will do for now, as some of the other McMillan Runner's Core exercises seemed to be aggravating my adductor problem area. THURS: Cycling 10 mi, 00:31 @ 19.4mph pace. Trying to keep a good rotation going of cycling, running and yoga.